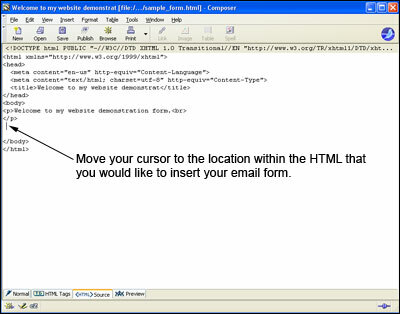 Using SeaMonkey Composer to add an email form to your website is outlined within the tutorial below. Please note that this tutorial was created using SeaMonkey Composer 1.1.15. The procedure may vary slightly if you are using a different version of the software. 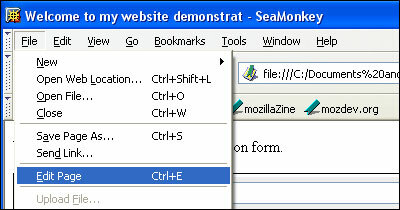 Please also note that SeaMonkey Composer is essentially the same software as Mozilla Composer. The process for adding forms to both is essentially identical. The easiest way to design your form is using software such as myContactForm.com, which allows you to generate custom HTML form code. For step-by-step instruction to do this, read this tutorial. Start SeaMonkey as you would normally do. a. To create a new page, go to File > New > Composer Page (or press CTRL+SHIFT+N). c. Then select File > Edit Page (or press CTRL+E). a. 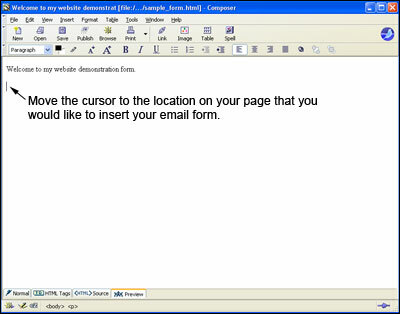 In the view use your mouse and move your cursor to the spot on the page where you would like the form. 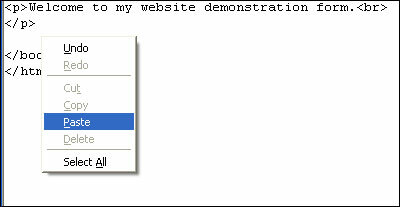 b. Click the button to enter the HTML Source View. You can also access this by clicking View > HTML Source. e. Click the button and make sure the form looks correct. You can also access this by clicking View > Preview. Upload the file containing your form to your web server. This procedure will vary depending on which external FTP client you are using. Finally it is time to test that the form is fully functional. Open a new browser window and go to the web page containing your form. Enter all of the form fields and press the submit button to send a test submission through. Check your email to ensure that all of the data was properly sent. 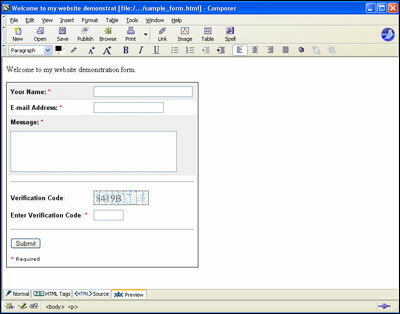 A test form created using SeaMonkey Composer can be viewed here.